Simply looking out from a balcony or terrace onto the beauty of nature can calm your senses and lower your stress levels. Spending time in your garden is good for your health and well-being, but instead of just mowing the lawn or weeding the flowerbeds, take the opportunity to simply enjoy relaxing with family, socializing with friends, or take time out to unwind on your own. When you create an outdoor room on your deck or patio, or a secluded seating area hidden at the bottom of your garden, you can sit back and appreciate your homemade stylish garden planters, and all the other projects and areas of your garden that you’ve been working on. Often, a patio or terrace is in full sun during the day, and the heat and light can be off-putting. By choosing retractable awnings for your home, you can sit outside all day long, shaded from the sun. When extended, awnings also have the effect of defining a space, giving your patio the feel of an outdoor room. If you place your garden planters at either corner, you’ll give further structure to the area, as well as adding an air of elegance. Adding outdoor furniture means your patio becomes a practical living area, and once you include a sumptuous corner sofa created from old pallet boxes and homemade cushions, you’ll be drawn outside to enjoy the fresh air more, and make the most of long, sunny summer days. Under your awning in the early evening, your outdoor room can then be transformed into a great place to dine al fresco, or simply enjoy a quiet drink watching the sunset. 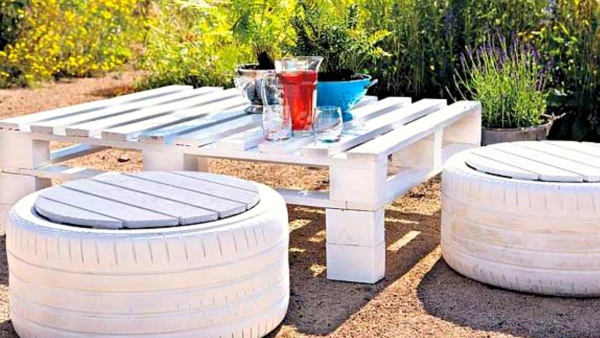 For extra seating for your friends, old tyres can be transformed into stools with just a lick of brightly colored paint and some foam to create cushions in the center. Pull up your tyre seats to a simple trestle table to eat, then light up a fire pit so you can enjoy sitting out long after the sun has gone down. Small candles placed in mason jars will add a magical feel to your outdoor dining area in the evening. Sometimes, you may just want to enjoy the peace and tranquility of your garden on your own. Create a small sanctuary in a secluded corner of your garden by laying a stone path that leads to a small, painted metal table and chairs. 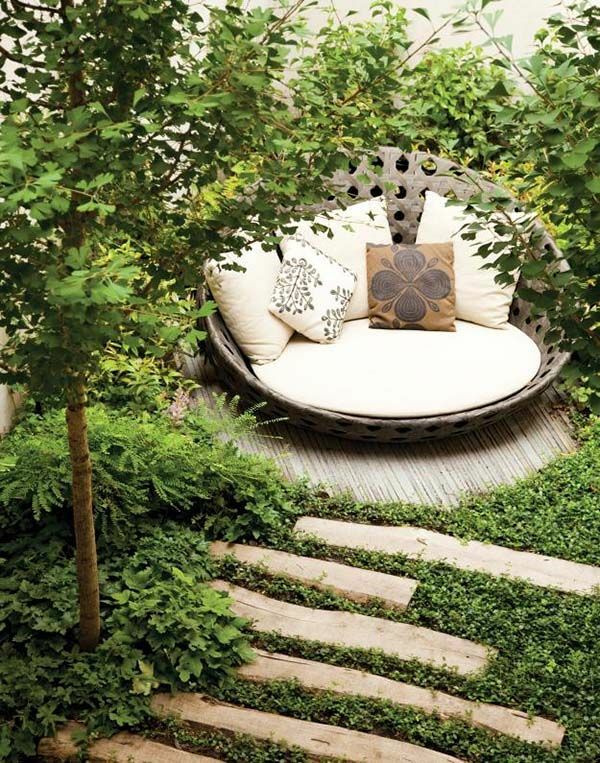 Alternatively, if you have a large tree in your garden, construct a simple, hardwood tree bench around the trunk to create a cool and comfy seat in the heart of your garden from which you can enjoy a 360° view. You can also check this refreshing indoor office garden ideas. 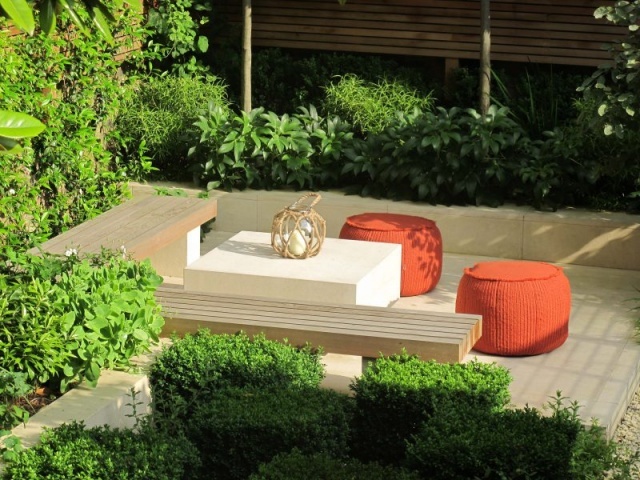 By creating an outdoor room in your yard or a small secluded seating area in your garden, you can look forward to the long summer days ahead. Experimenting with ideas for easy homemade seating means you’ll have no excuse to not sit down, relax and enjoy your garden fully. Check out these DIY wood planter box designs.